Psst. Hey kid. Wanna try a cigarette? Remember those commercials from back in the day, when cigarette companies would use cartoons and colorful, wacky characters to try to get kids interested in smoking? Yeah, those weren't allowed to last long for obvious reasons, but the marketing plan behind it is known to work. Get the kids hooked early and they'll be yours for life. It's the same with something like Star Wars. Most of us fell in love with it as kids and are still fans, and now Lucasfilm is reaching out to ensure the next generation of Star Wars devotees. 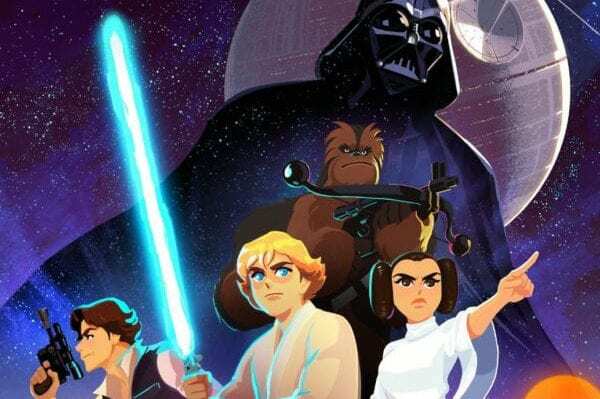 Lucasfilm has announced the launch of Star Wars Galaxy of Adventures, a series of six animated shorts that can be found over at StarWarsKids.com and the Star Wars Kids YouTube channel. This initiative is designed to help older fans introduce the world of Star Wars to their kids, so they too can spend a fortune on merch, movies, and more. The first six shorts combine original dialogue, music, and sound effects with bold new animations, and fun and educational add-ons designed to help older fans, parents, and other mentors to welcome the kids in their lives to explore the galaxy far, far away. Additional shorts featuring fan-favorite characters will debut in December, with regular releases following in 2019. Directing the episodes will be Barry Kelly, best known for his work on The Venture Bros., Black Dynamite, and other well-regarded animated shows. I guess this is where you go if Star Wars Resistance, Star Wars Rebels, or those Forces of Destiny shorts are too complex for the kiddo? As a single, childless loser there ain't much reason for me to get into this, but maybe show off the trailer to your kid, and maybe in a few years they too can write a thinkpiece about the many ways Rian Johnson "ruined" Luke Skywalker.